Campus police and the UO Bike Program are again teaming up to throw a little light on dark winter streets and a little love toward bikers. Students could find themselves with a free bike light instead of a citation under a program encouraging safe riding. And next week they’ll have lots of chances to warm up, get their bikes winterized and check out some cool gear during Bike Appreciation Week. While biking is a popular transportation option all year, the winter months can be especially challenging because it’s often dark in the mornings and evenings when much travel takes place. That’s why the UO Police Department is reaching out to riders to keep them safe and legal. During winter term, the UO Police Department is taking part in the “Bike Lights, Not Citations” campaign for the second year. When officers stop students for riding without a light they’ll have the discretion to issue a warning and some education, and in some cases a free bike light. 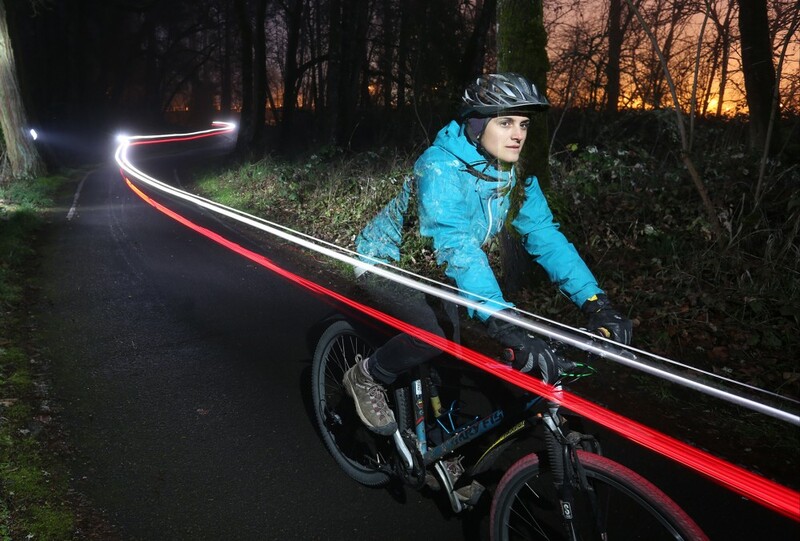 Oregon law requires bicyclists to have a front light with a minimum visibility of 500 feet and a rear light or reflector with a minimum visibility of 600 feet. Failure to use the proper lights is a Class D traffic violation and can result in a fine of up to $90. Violations of the lighting law are among the most common seen by UOPD officers. And during winter term, it’s hard to avoid riding during the hours of darkness. If a bicyclist is in a collision with a car, the lighting law could be used against the rider and result in a citation. Riders with proper lights and reflectors are less likely to be in an accident or to be blamed if one occurs, police say. A limited number of free lights will be handed out to students stopped for riding without one as part of the #BikeSmartUO campaign. Information on bicycle laws, riding tips and equipment also is available from the UO Bike Program. The bike light giveaway is sponsored by the UOPD, UO Bike Program and The Duck Store. Also, the Bike Program will be holding Bike Appreciation Week from Tuesday to Friday, Jan. 17-20. Every morning, free coffee, bike repairs, bike lights, reflectors and swag will be doled out in front of the UO Bike Program and Outdoor Program in the Erb Memorial Union. People can register their bikes with UO Parking and Transportation, meet adventure cyclist extraordinaire Willie Weir, have the UO Bike Program mechanics work on their bike's aches and pains, learn more about the UO Cycling and Mountain Bike Team, and get inspired by UO student group LiveMove. For a complete schedule and more information, see the event’s Facebook page.